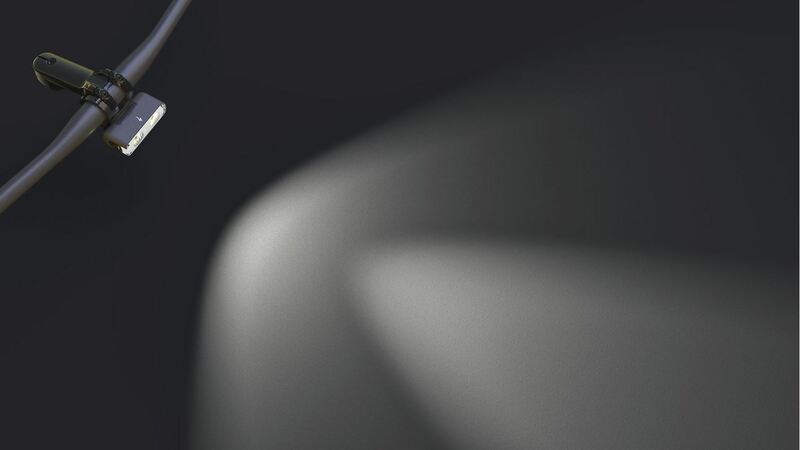 A few years ago we tested the Specialized Flux front light when it came out on the market. This year the American brand is offering a new version of the Flux, the 1200. More compact and lighter in weight, we’ve been able to try it in the last few weeks. Quick release mounting system for 22.2 – 25.4 – 31.8mm diameter handlebars with rubber adapters included in the package. Mounting system to position the headlight in front, above or below the stem. 3400mAh Li-Ion internal battery, rechargeable via USB Micro plug. 1200/600/300 Lumen LED brightness in three fixed modes that can be operated via the side button. Preset 1:15- / 2:30- / 5:00 hours depending on the mode. Depending on the mode chosen, up to three hours of extra battery life is available. Very low output after the declared preset time. Fast 90% charge in 1.5 hours, full charge in 3 hours. Aluminum external headlight material and collar. Quick release in plastic. To switch on and select the three brightness levels, press the rubber button on one of the two sides of the Flux. On the other side is the USB charging port. If you hold it down it turns the lamp off, while if you hold it down for a long time you enter the loop that contains the daytime flashing light, wide and narrow flash and camping flashlight mode (watch the video to understand the differences). If you hold it down for even longer, the button is locked in case you have to carry it in your suitcase and you do not want it to come on unintentionally. Mounting the collar on the handlebar is very simple and requires no tools, just as it is easy to attach and detach the headlight leaving the collar in place. Just press on the plastic tab to loosen the clamp. Being able to fix it above, in front of or under the handlebars is very convenient, because you can find a position that does not interfere with cables or GPS. Once pulled out of the box the first impression is that the Flux is robust and well thought out in detail, as well as being very lightweight, at 185 grams, including the collar. I used the Flux 1200 mainly commuting to and from the office (sometimes in the rain), which provided light in passages in the woods that were completely dark as well as roads open to traffic. 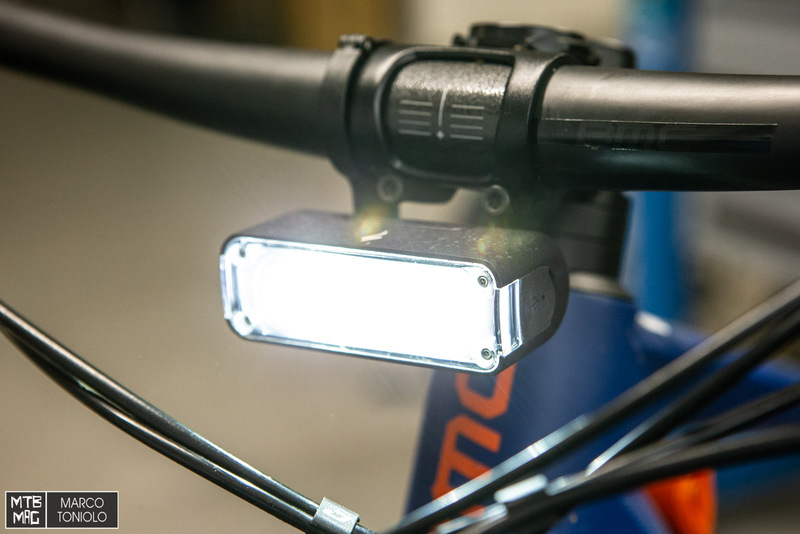 The rectangular light beam ensures that it does not dissipate upwards, thus avoiding blinding those who encounter it, especially when using the less powerful mode at 300 Lumens and pointing it downwards a bit. Due to its shape, the Flux illuminates laterally, near the bicycle, rather than in a “tunnel”. I found this light perfect for mixed use, with a power designed precisely for urban / road areas. I used my MTB in combination with a Lupine mounted on the helmet, especially when climbing uphill where I could keep the Lupine off and pedal with the Flux set to 300 or 600 Lumen, which makes it last longer. Alone, even at 1200 Lumens, it’s fine in the woods if you keep the speed down. Speaking of battery, I happened to arrive at 3 hours of emergency time. The light beam is weak, but more than enough to see where you need to go, even if you are completely in the dark. You just have to adjust the speed accordingly. In traffic the cars saw me without problems. In contrast to the previous model, this Flux is not equipped with a remote control to decide which power to use and is not compatible with the old one because the socket is Micro USB, and not Mini. The side button, when pedaling, is not always easy to identify in the dark, particularly if you are wearing winter gloves as the current season requires, at least where I ride. The new Flux 1200 is very compact and powerful, given its size. The handlebar assembly is well thought out so as not to interfere with cables or displays that are already present. The rectangular light beam also illuminates the edges of the road well and, if pointed downwards, does not blind other users on the road. Off-road, it is best to combine it with a headlight mounted on the helmet, especially if you ride technical trails. The side button for power adjustment is not always easy to find when riding in the dark and wearing winter gloves.